The sensitive alt-lite are turning into the snowflakes they mock. The alt-right is a barely-organized group of white nationalists whose members spend a lot of time online obsessing over Jews, cucks, Hitler, white genocide, and the genetic superiority of Caucasians. Most of them are better at sharing Pepe memes online than representing their political views in public. Their more presentable cousins—sometimes called the “alt-lite”—share many alt-right views, especially those related to controlling immigration and cracking down on terrorism, but overt racism and National Socialism aren't for them. The alt-lite formalized its divorce from the alt-right with the DeploraBall in Washington, D.C. on the eve of Trump's inauguration. Alt-right luminaries—most notably Richard B. Spencer and Baked Alaska (Tim "Treadstone" Gionet)—were publicly disinvited to the soirée, and the rift was on. The alt-right was the first to stake their claim to the White Man’s Island. They view the more marketable alt-lite as arrivistes—elitist bandwagon jumpers more likely to take an Uber than a pickup truck to the next anti-sharia march. They were supposed to have ascended after Hillary Clinton called them out publicly in her speech, but it turned out that the flashier types have stolen the limelight now. 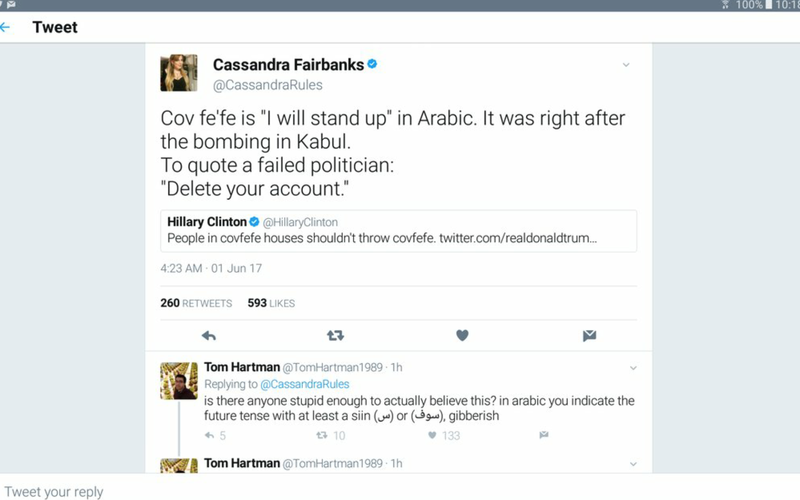 Other alt-lite personalities include fired Breitbart provocateur Milo Yiannopoulos, Vice Magazine co-founder Gavin McInnes, Infowars’ Paul Joseph Watson, DeploraBall organizer Mike Cernovich, activist/journalist Cassandra Fairbanks (who tweeted that “covfefe” means “I will stand up” in Arabic) and Gateway Pundit's White House correspondent, Lucian Wintrich. Two other alt-lite members caused a stir on Friday evening when activist/ journalist Laura Loomer ran onstage in protest during the Public Theater’s Central Park production of Shakespeare's Julius Caesar. As she interrupted a scene depicting the assassination of a Trump lookalike, Loomer shouted, “Stop the normalization of political violence against the right,” while Roger Stone associate and former Navy Reserve intelligence officer, Jack Posobiec, filmed the event. Posobiec bizarrely chanted, “You are all Goebbels” as he filmed the “free speech” exercise, which probably confused the audience even more. There to enjoy some theater in the park on a warm evening, they found themselves compared to Hitler’s propaganda minister. That's a stretch, but what can you expect from people who think that the play is a celebration of the great general's murder? Maybe you can expect them to shout at the audience, “You guys are as bad as ISIS,” as Loomer did when security had escorted her outside of the theater. To these two right-wing versions of the social justice warrior, who were obviously personally offended by a work of art, theatergoers can be compared to the worst people on earth. Had they done their homework, they'd have learned that The Guthrie Theater staged a production of the same play in 2012, with an Obama lookalike as the murdered Caesar. The left had the good sense to lay off that one. Censoring art, after all, is what fascists do. Dapper alt-right avatar, Richard B. Spencer, tweeted out his scorn for the protest, calling Jack Posobiec a rube who’d just interrupted the first play he'd attended. Spencer also went after Lucian Wintrich, who sided with Loomer and Posobiec. He'd previously called the openly gay Milo Yiannnopoulos wannabe a degenerate, and Wintrich hit back by tweeting that Spencer was a closeted gay man. Spencer picked the wrong battle. He gained nothing by attacking Wintrich. Now the accused crypto-Nazi’s got crypto-gay rumors to deal with, which will interfere with the Aryan alpha male brand he's trying to build. The left blamed talk radio for the 1995 Oklahoma City bombing and it hasn't stopped claiming that right-wing rhetoric causes violence. They want words to be equated with violence so they can censor expression they don't like. The right wing has always seen the insidiousness of this approach, but now it's threatening to descend into reactionary tribalism and play the same game. Mike Cernovich said he’d give $1,000 to anyone who disrupted Julius Caesar, so there's another corrupt incentive. What he and Posobiec, Loomer and the rest of the alt-lite intellectual lightweights don't realize is that Joseph Goebbels would be proud of Posobiec and Loomer, not the audience. The National Socialists went after any form of artistic expression that displeased them. When the ends justify the means, violence will soon follow.